Back to our regularly scheduled program. From a high of 15 people (10 of which were children) we are back down to our mere five. Dinner tonight was rather lonely. We had a peaceful, happy holiday spent with good friends and family. What better reason to be thankful? The meal is leftovers, the bellies are stuffed, dishes and pots are washed and put away. The giant table that contained all of us for our dinner has been disassembled. It is but a memory…until the weekend when we pull out all those leftovers for a 2nd turkey dinner of sorts. Hope your Thanksgiving was everything that you hoped it would be, shared with those that are special to you. Happy Turkey Day all! My great aunt, Mary used to arrive for dinner during Thanksgiving or Christmas with the backseat of her car literally filled with pie. I smile when I think of it, a sight etched in memory, because it was always us kids that got to help her empty her car. The pies were awesome looking, all homemade of course, and tasted wonderful. Even after stuffing ourselves at dinner (I come from a part Italian family, so food- well food is courses and courses at a holiday meal) and swearing that we couldn’t eat another bite, when the pies came out – well there was always room for dessert. Age brings reminiscing and longing for those comfort foods. Tomorrow we will have a dinner that shares many of those same foods that Tom and I ate growing up. We’ll share it with family and then later with friends, the things that holidays are made of. It is always important to pause and remember why we are thankful. Reflection is good for the soul. This holiday, I am thankful for everyone being healthy and able to come together to share a good meal, laughter and family. I have a terrific husband and three great boys and I’m a very lucky lady. Holidays are also a time to reflect on the people, dear to us, who are no longer seated at our table, but are with us in our hearts and memories. Nothing fancy here. Just about the fanciest thing (if you can call it that) about our cranberry sauce this Thanksgiving is origin of the cranberries. 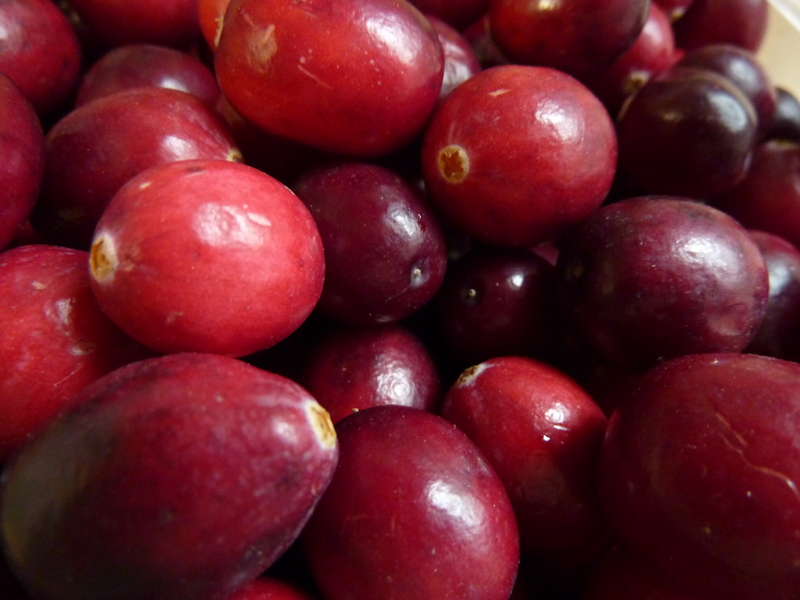 The cranberries used in our cranberry sauce came from The Vermont Cranberry Company in East Fairfield, Vermont. Otherwise, none of those fancy names, or ingredients in our sauce. It’s not cranberry relish or cranberry chutney or anything. It’s just plain old cranberry sauce. Three simple ingredients – cranberries, water and sugar combined to make that sweet, tangy accompaniment to our Tom Turkey on Thursday. We don’t mix in orange or cinnamon or anything, just plain jane cranberry sauce, whole berry, of course. People will buy anything, won’t they? Magical Reindeer Gem necklaces $15 each. Sounds pretty neat? Proceeds go to the Miller Park Zoo in Illinois – sounds like a good benefit. The zoo anticipates that sale of necklaces and related ornaments might raise $16,500 if all items are sold. This will help supplement the budget deficit the zoo has had to endure in recent years. The only problem that I see is that the necklace “gems” are really dried, painted (and sterilized) reindeer poop. The zoo has volunteers who collect the dung, dry and sterilize them and then glitter paint them and string them onto necklaces. Seriously, who buys this stuff? There is no false advertising or misleading information – consumers know full well that they are buying reindeer poop. But again, who buys this stuff? Evidently a lot of people feel the need to have dried reindeer poop hanging around. Last year, the zoo made the dung into ornaments and completely sold out. This year, the reindeer poop can be hung around your neck or hung on your tree. I don’t dare ask what the zoo has in store for next year. Today was a monumental day here at the T’s house, 3+ years in the making. 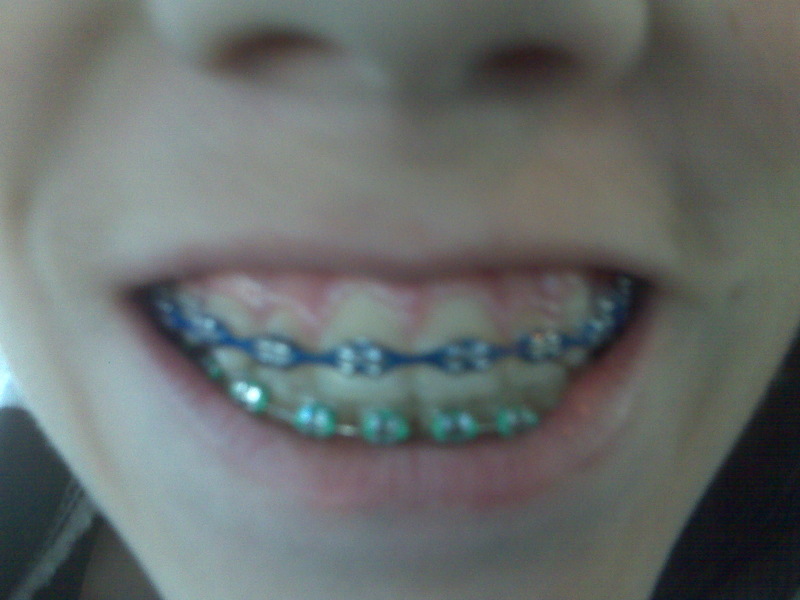 Oldest son was scheduled to get his braces removed today. He was more than ready, since he had seen his brothers and many friends in and out of braces while his mouth was still “under construction”. Part of it was due to the fact that he had an an ankolose baby tooth that required surgery to remove and then more finagling with his bite to preserve the space. In a good mood, he let me snap this picture on his way into the orthodontist this morning. 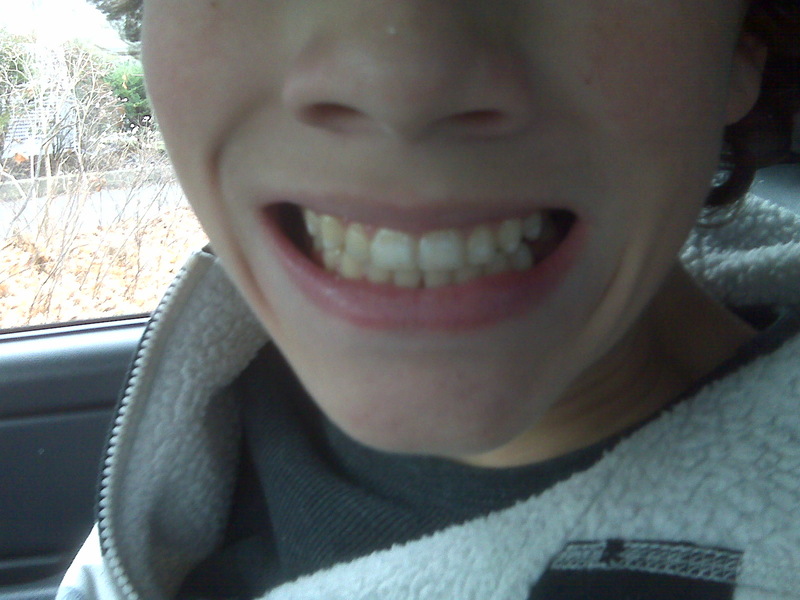 And this picture when he came out from the orthodontist’s chair about 45 minutes later. He was pretty darn happy and pretty darn committed that while I could snap the pictures, I was not allowed to take his whole face, just his teeth. 14, oh boy, the concessions we moms must make. He left the orthodontist’s office armed with two packs of (sugarless) gum and a note to go back to school. He seemed pretty happy. We were fortunate to be invited to a wedding for the owners of a local restaurant that we frequent, Harry’s Cafe. Debbie and Trip have provided us with many an enjoyable meal. 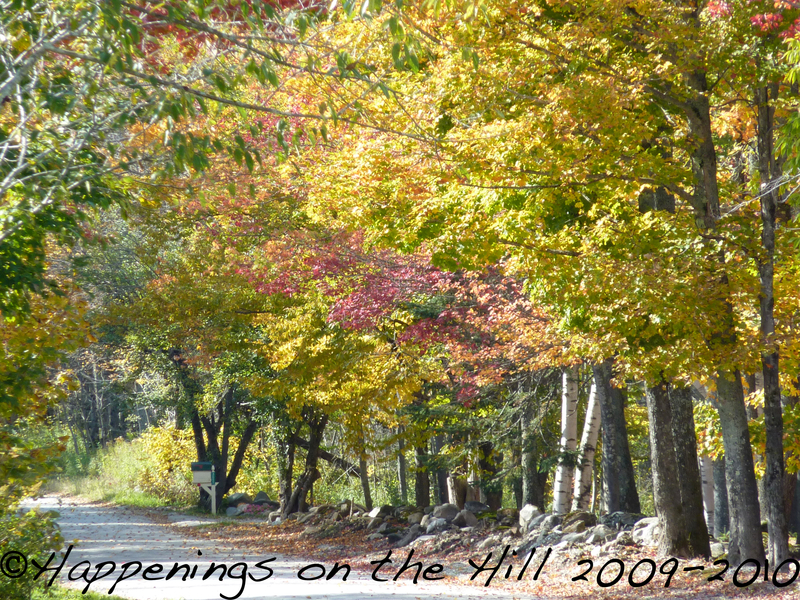 The restaurant is located in Mount Holly, close enough to our house to sneak away for a child-less dinner here and there. Trip, Debbie and the entire staff make you feel like family when you are there. It doesn’t take many visits to feel like you’re going to a good friend’s house for dinner. We were honored that they considered us friends and included us in their special day. The wedding was held at the Weston Playhouse, a beautiful venue for a wedding. The ceremony was simple and elegant. The food, was delicious. I learned from members of their staff, that Debbie, Trip and the staff cooked the food served that evening in the nights preceding the event. 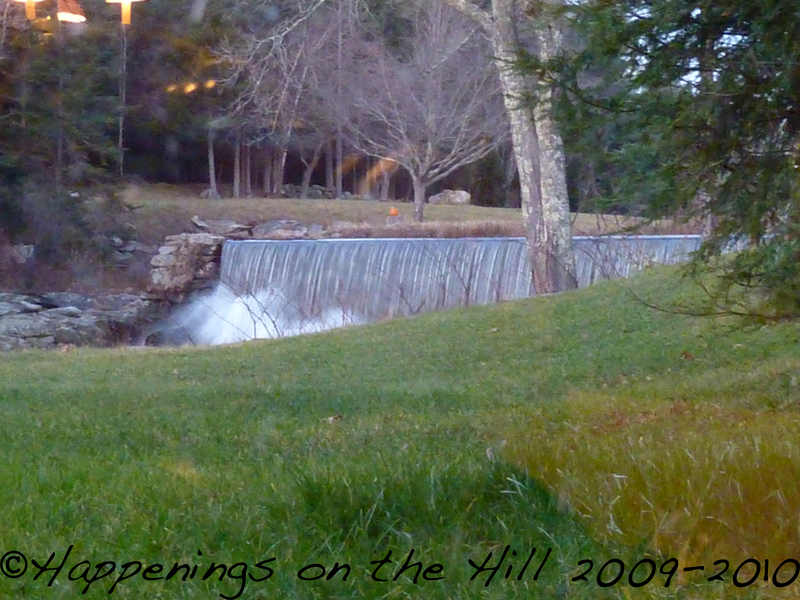 The photo is the view from the window by where we ate our dinner. It’s the time of year when we give a lot of thought to what we have and what makes us lucky and happy. Basically, it is the time of the year to stop bitching and complaining about what we don’t have enough of – be it time, money, friends, work and to start recognizing what we do have. It is simply a time of the year to take stock of our lives and to enjoy the moment. All too often, especially in this country, we are bombarded with wanting more, needing more, demanding more and we rarely take the time to examine what we have, and how lucky we are for what we have in our lives at this moment in time. For many, the next week starts a spiral of stress. The beginning of the holiday season all too often brings with it stress, social pressure to attend this event and that party, time management issues how to work and shop and do all those wonderful Martha Stewart-like things that we feel guilty that we don’t have the time or the money or the patience to deal with but we think that we should. Newspaper and magazine articles and blog postings are replete with tips for the “perfect” Thanksgiving dinner, turkey, pie, side dish, appetizer, table setting, house decorations – you name it, and someone, somewhere has the “perfect” tip to make you feel miserable, incompetent and less than perfect. To quell your anxiety and mine and put life back into perspective, both for this Thanksgiving and the upcoming holidays, take a breath and read this post. Realize that the background of this family is that one of their children has leukemia. Keep them in your thoughts and prayers as I am certain they would appreciate all that they can get. Realize that your life, however miserable you think it is, or how sorry you might feel for yourself with all you have to do in the upcoming weeks, really isn’t all that bad and you really have a lot to be thankful for. I know that I am thinking exactly that this holiday and realizing just how fortunate we are as a family and how lucky I am as wife. One week to Thanksgiving folks. For those of you hosting Thanksgiving, as I am, this is the final stretch. There is the shopping to do (our turkey is a local one that is already ordered and will be picked up on Wednesday) and cleaning and organizing. The funny thing is that quite honestly, besides the five of us, I really don’t know how many people will be here. We thought that my inlaws were coming, but they are not. It appears that we will be joined by my sister and her family which will make us ten in number for the holiday. A nice manageable number. For those of you in Vermont who feel you are ahead of the curve and planning to include locally grown items on your Thanksgiving table, here’s a fun contest. LoveEarthAlways.com is sponsoring a Localvore Thanksgiving Menu contest. All that is necessary is to submit your Thanksgiving menu indicating which items are local, either from your own garden, your local farm or CSA or farmer’s market. They are offering prizes consisting of Lake Champlain Chocolates and locally made beeswax candles. Candles and chocolate, come on – what better reason to enter? For complete information and entry go to LoveEarthAlways.com. Here is a worthy cause. The Vermont National Guard Foundation is trying to raise the sum of $200,000 to bring the Vermont National Guardsmen and Guardswomen who are in training in Indiana home to Vermont to spend Christmas with their families before being deployed to Afghanistan for their respective duty tours. The Foundation has calculated that with $200,000 they will be able to bus all the 700 Vermont Guards home to spend the holiday with their families. For those little boys and girls, husbands and wives, parents and children – I think this is a great cause. If you have it in your heart and your wallet to spare a little cash to make some people’s Christmas a little happier, here is the link to the Vermont National Guard Foundation where you can make a donation. If you live in Vermont, various local groups and individuals are taking up this cause. For example Price Chopper stores in Vermont are taking register donations and will match donations up to $10,000. Two young sisters from Burlington, ages 11 and 9 are canvassing their neighborhood collecting cans and bottles to redeem to donate to the cause. Their story can be found here. As of November 12th, the organization has raised $150,000 toward their $200,000 goal. So close, relatively speaking and I am sure that there are a lot of people keeping their fingers crossed that the goal will be met and some will have something special to celebrate this holiday season. It appears that the rest of the Ts have escaped the stomach bug that dropped Tom and Tyler like rocks. Both of them were down for the count through the night before last and all day yesterday. I think that it was honestly about 8:30 last night that Tyler actually spoke and moved. Prior to that, he was groaning, moaning and of course vomiting. Don’t know where that bug came from since no one that the boys know has been out sick from a stomach bug (everyone is far too busy being knocked on their butts from the swine flu around these parts). This could have been much, much worse, particularly with the upcoming holidays. Must have been all that laundry I did yesterday – making sure that everything was washed just in case I was the next one to fall.